Trash vortexes are not a satiric entity found in science fiction or graphic novels—they are entirely real. Made up of plastic junk lost at sea, trash vortexes are masses of plastic pollution that are stuck together by currents, mores specifically ocean gyres, trapped in what is best described as a “soupy” vortex. Like alphabet soup—but with trash—some visible and some in the form of microplastics. The Pacific Trash vortex is the biggest one we have—roughly two times the size of Texas. And, at our current pace, is not going to be shrinking any time soon. Plastic isn’t biodegradable and a lot of it just breaks down into smaller and smaller pieces through photodegradation. This, coupled with the fact that about 70% of all marine debris, which is the term for litter that ends up in bodies of water, actually ends up on the ocean floor – well, it accumulates into some horrifying realities. Plastic doesn’t just swirl around in the ocean producing an eyesore—it’s far more nefarious a character than that. Marine life mistake small plastic particles for food and consume it readily. Plastic bags look an awful lot like jellyfish to a hungry turtle. A bird can easily feed a plastic resin pellet to its hungry babies, thinking it no different from a similar looking fish egg. The mothers will then watch their chicks die a slow death—of either starvation and malnutrition or of gut-wrenching ruptured organs. As usual, humans aren’t the victims of this atrocity. We not only created the trash piles swirling around in our bodies of water, but we knew it was going to happen long before it was actually discovered in the early 2000’s —the National Oceanic and Atmospheric Administration (NOAA) PREDICTED it would happen in 1988 based on plastic accumulation measurement research conducted between 1885 and 1988 in Alaska. I have been paying a lot more attention to plastic lately. Not only because I want to be a decent human being and limit my negative impact on the world around me, but also because as a staff member of SEHN, I have been able to get better acquainted with the works and brilliance of some of the environmental field’s finest minds. I follow SEHN board member Rebecca Gasior Altman’s works extensively. Her published works, but also her Instagram page that so clearly weaves her personal and professional lives into a tapestry of motherhood, environmental activism, and the history and pervasiveness of plastics. If you aren’t tuned into her work, you should do so immediately—especially on this World Environment Day where the theme is plastic pollution. Her most recent project on social media has been to write a mini essay series on types of plastic, called The Resin Codes. “Over the past 10 years, we’ve learned how sunlight and waves break down plastics into microscopically small parts. They swirl in all the oceans’ major gyres, of which there are five. In places, microplastics outnumber plankton. Plastic is a part of our inheritance. That is such a startling and poignant sentence in and of itself. Plastic and pervasive are almost synonymous. I was thinking about this pervasiveness as I was driving to my second job, trying to make it home to my computer in time to participate in a webinar on How to Change a Story, led by Leah Lamb, another brilliant mind of our times. 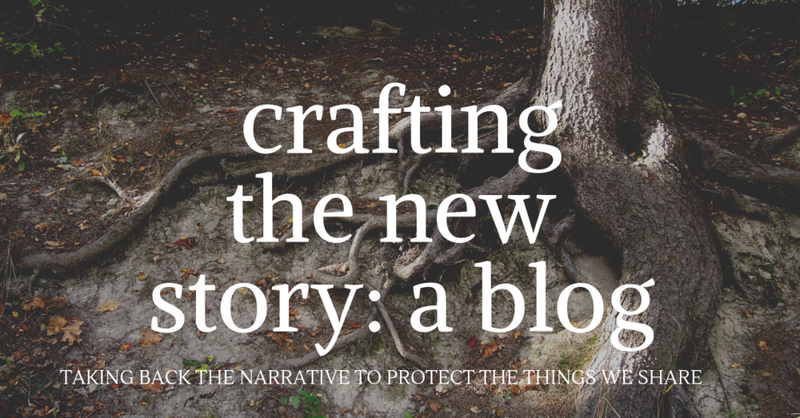 Lately, our SEHN team has been talking a lot about what it means to change the narrative and craft the new story as we navigate the, for lack of a more appropriate word, soupy vortex of our political, social, and economic climate. I thought a lot about Rebecca’s work on the story of plastics and how she has entirely changed the way we think about plastics. And I also thought about nurdles. Which sounds like a word I just made up, but actually did not. Nurdles are the small pellets of plastic, approximately the same size as a single lentil, that are the basis of the raw material used in the manufacturing of plastic goods. I thought about nurdles because, for some reason, they are also called Mermaid’s Tears. Now, I am going to assume that the readers of this post are not as interested in mermaid lore as I might or might not be. Mermaid’s Tears used to be the more fantastical name for sea glass. The story, based on Roman mythology of the violent-natured sea god, Neptune, was that sea maidens (mermaids) possessed fantastical powers, but were forbidden (by Neptune) to use their powers to change the course of nature. What happens next is slightly reminiscent of the plot of the Disney movie, The Little Mermaid. Mermaid is forbidden to intervene in the course of nature, mermaid falls in love with attractive young sailor, chaos strikes the ship, attractive young sailor is rescued by mermaid. Now, we all know that lore is not anything like Disney—it’s more like the Grimm’s Fairy Tale version of events. So, instead of winding up with the attractive young sailor/prince in the end, the sea maiden in Neptune’s story was exiled to the deepest depths of the ocean for her sins. In keeping with the story, her tears are so beautiful and so many, that they wash ashore, speckling beaches with the soft green and blue pieces of sea glass so many beach-goers covet. Now the story has changed. No longer are mermaids crying beautiful tears of sea glass over their tragic lost loves. They are ugly sobbing plastic nurdles as they swim around the piles of trash we deposited into the oceans. Neptune is no longer the malevolent character in the story—we are. I’m calling it—the mermaids want the nurdles and the trash soup to change.